Jacob Boisse is the kind of kid who might be president one day, possibly the first Hispanic-American president ever in the United States. His ancestry is Mexican on his father’s side and Spanish on his mother’s side. 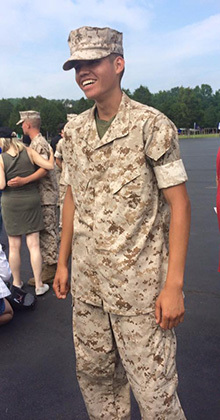 He is a hard-working, bright, articulate and determined Student and Athlete who has always wanted to serve his country as his father did in the U.S. Marines. As a young man growing up some of Jacob’s favorite television channels to watch have been the History channel and the Military channel. A favorite strategic-thinking board game is RISK. As a youngster he played in the dirt in front of his house with plastic toy figurines who were engaged in make-believe battles protecting all that is good in the world. Jacob felt his calling then and he has been focusing on that pathway ever since. Prior to his graduation from Castro Valley High School in 2014 he applied to a diverse number of colleges with strong military service programs and partnerships. He chose the California State University Maritime Academy in Vallejo, CA, which offers military and corporate business career pathways. Jacob is majoring in Global Studies in International Maritime Affairs. What’s up next for Jacob? He is soon starting his third year, junior year, at the Maritime Academy. In addition, he’ll report to his regional platoon where his role will be to mentor, train and prepare new PLC applicants as well as prepare himself for his second of two six-weeks at OCS end of junior year. He will also compete as a Student-Athlete for his third year on the Maritime Academy rowing team. When he was in high school he was a distance runner and for many years prior to that he was a martial arts instructor and student. After completing his second six-weeks at OCS he will complete his senior year of college and graduate. A four-year college bachelors degree (and a high school diploma) are required to become an officer. If all goes well, with all of the hard work, planning, dedication and grit, Jacob will be commissioned as a 2nd Lieutenant in the U.S. Marine Corps. At that point he will depart to The Basic School (TBS) at Quantico. TBS is a six-month higher level Marine training program. After TBS, depending on one’s status, officers will go into a field of qualified high interest. Good luck to you, Jacob, we are proud of you and look forward to staying in touch and seeing you go and grow! 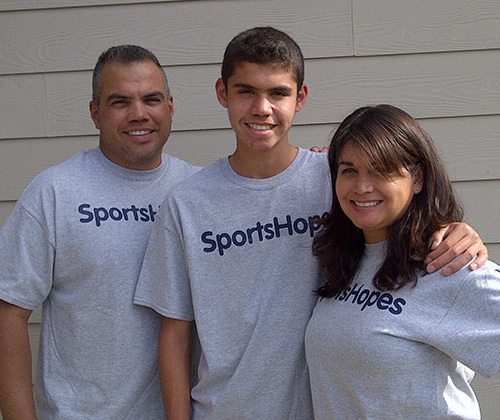 Photos: Jacob at completion of first PLC 2016; Jacob while in high school with his father, James, and mother, Jeanette, all part of the SportsHopes family.